Vision Solutions is the premier provider of software solutions designed to protect data, minimize downtime and maximize resources for the modern data center. We are the only company to deliver workload migrations, high availability, disaster recovery and data sharing – across any hardware and any physical, virtual or Cloud-based environment. We have been serving enterprises and managed service providers for over 25 years through our portfolio of Double-Take®, MIMIX® and iTERA® product brands. Double-Take DR helps you create a reliable disaster recovery plan with minimal infrastructure investment and enables you to diversify your existing strategy to avoid a single point of failure. If you’re looking for an easy-to-use, scalable disaster recovery solution that can protect and recover data and entire servers across physical, virtual, and cloud-based resources, you’ve found it. 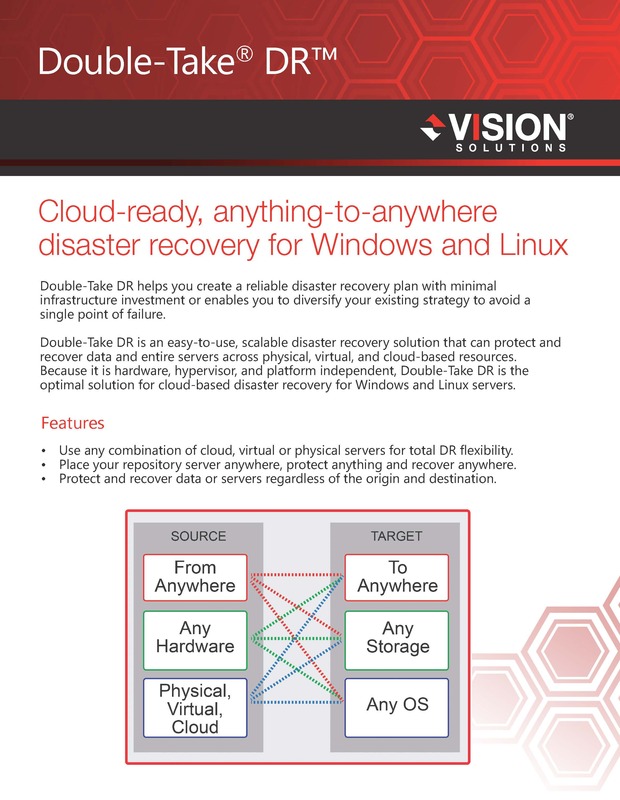 Because Double-Take DR is hardware, hypervisor, and platform independent, it’s the optimal solution for cloud-based disaster recovery for Windows and Linux servers. Use any combination of cloud, virtual or physical servers for total DR flexibility. Place your repository server anywhere, protect anything and recover anywhere. Protect and recover data or servers regardless of the origin and destination. Flexible options for protecting varying levels of RTO data and servers helps you optimize your budgets and protect and recover heterogeneous data centers and infrastructure. Choose any server, regardless of applications and data configuration, and easily configure protection. Take advantage of hosted, private, or public cloud platform scalability and rapid provisioning for complete business continuity without complicated and costly infrastructure. Set up target repository anywhere for fast access to public or private clouds from any location. As organizations today face increasing availability expectations and their dependency on applications data for business intelligence is amplified, they’re realizing that a resilient enterprise founded on a trusted protection strategy is more critical than ever before. Vision Solutions helps organizations reach their potential by eliminating barriers to success and providing the world’s most trusted solutions for eliminating planned and unplanned downtime. We have always been sensitive to the infrastructure budget constraints in which all organizations must operate, so we design our products to work equally well with legacy systems and the most cutting-edge technologies. As a result of constant innovation, Vision’s products are ready to protect and recover data on any platform in any combination of physical, virtual or cloud servers. Vision also has a mission to make life easier for IT staff by engineering products that allow them to do their jobs during core hours and receive mobile alerts in case of an outage.